Honestly you're better off using Gumtree &amp; eBay and spend the £60 on used stuff. For that money you can pickup a nice selection of track &amp; rolling stock especially if you shop around. Track is dirt cheap from Hattons. I use peco flexi track in 1m odd sections then cut to size if necessary. Avoid buying used Hornby points as they can cause derailment when worn. 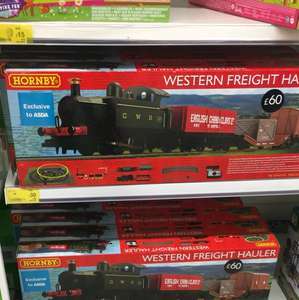 Hornby's quality is pretty poor for the price on their normal sets. Gave up with them years ago especially as they seem to have a huge problem in financing new sets with modern trains. We aren't all baby boomers wanting steam engines! Serious model kit, the box is 17" tall! This is what all trucks should look like. Wow you got in there fast! £48 now! its the same price every year. i wonder if they will finally reduce this to £30 to get rid? Got to have some head of stem and get stocked out of the cold, come on. 15% off site wide. Nice prices to start. Free delivery on everything. Use PRIMEDAY code at checkout. Great lunch box price heataaaggeee !!!! That's odd; PRIMEDAY didn't work for me only PRIMEDAY17. Both work it seems, their email said just PRIMEDAY, that's where got it from. Lego Friends Cupcake Cafe was £24.95, it's now £36.02. Even with the 15% off code it's too expensive. Can't see anything in the Lego Friends range worth getting at these prices. Heat for Hornby. Stock was 8 but now down to 4. 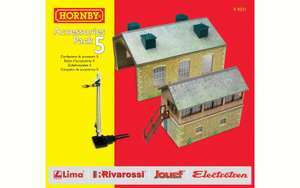 Using code LMVQL gives 20% off at Very making the Hornby set £47.99 (code valid for existing customers, expires 11 June). Still don't know if my son needs it though! I love Hornby but the Postal Express set sells for £60 to £70 odd elsewhere (£59.99 at Very). The £120 Tesco quote is the rrp so I think they were selling at too high a price to start with. 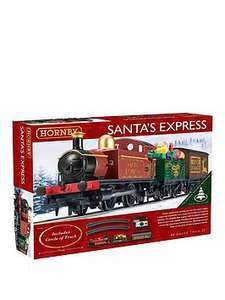 Still anything to do with Hornby gets my vote. The Micro sets are harder to play with. The cars fall off the track much easier. I'd be very surprised if the RRP was near £50 let alone £90 for this. Just bought....definitely needed the money for other things this month .... going to love it at Christmas!! He's only 5 - at 10 it might be different! Kids still play these? Would take a lot to drag my 10 year old away from GTA V! We got one for £40 today from the Bridgwater store - marked as £60 on the box and reduced to £40 at checkout. Thank you so much to the poster. My son is ecstatic - we had told him his Christmas money wouldn't stretch to a model train set then I saw this and fingers crossed we hopped down to ASDA first thing and there they were. Got it for £15 in Warrington Cockhedge Asda yesterday. It was just mentioned in the post linked in OP, no actual deal thread. In store today the accessories and track has been seriously slashed, most at half the on line price. Yeh? Couldn't see anything searching on 'hornby' or 'Hawkins'. hawkins hornby They were on here. A couple left now but looks like most are now sold as no longer in the list. Really enjoyed building this to find the electric circuits board does not work! My children are really gutted. I work in electronics and found the circuit board that controls the motor and speed to be at fault. Just feel bad because my little ones are upset it doesn't work. ​The implication being that any failure in the operation of the model is a result of the owner failing to assemble it correctly? I had one of these a few years ago, the engine spins the wrong way. Another Debenhams Airfix deal Hornby Memorial Flight Supermarine Spitfire MkVb Gift Set. Includes Model, Brushes and Paints. Its RRP is only £49.99. 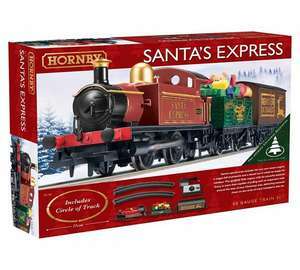 A good deal if only because I can say "Santa has got the Hornby". I don't have any kids but I would probably say that to them, doubt they'd end up growing up right if I was their Dad.